Texas music, bow hunting, waterfowl hunting, fishing, and lifting weights. Saw a bull last night driving on 17 that was still packing. I've been on them sporadically, but can't seem to connect. I've been concentrating on the east side of 17 where I did my scouting. But having a lot of new hunters showing up, and seeing less javelina. Should I try over on the Sedona side or VOC area? I know its late in the game to be switching up areas like that, but really want to be able to make it happen. Tagged out on my first elk during the late rifle bull hunt. 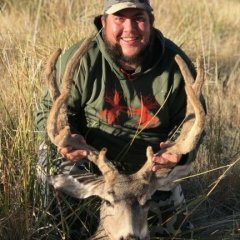 Moved to AZ from Texas back in 2016, hunting western big game has been the most challenging, humbling, and rewarding experience I've had as an outdoorsman. Drew my first tag.. 6A late rifle bull! Late rifle bull tag for me! Either 5B or 6A. Are there any quail within an hour or so of Flagstaff? I use old snow goose rags for my spreads back in Texas. We get them quite a bit on our property with 60 acres of winter wheat. Spray painted the rags grey and used longer stakes to put them in the ground. Seems to work alright. If anyone is around 11M, or close to Flag that needs some help packing out, extra set of eyes, whatever the case may be. I'd love to tag along.